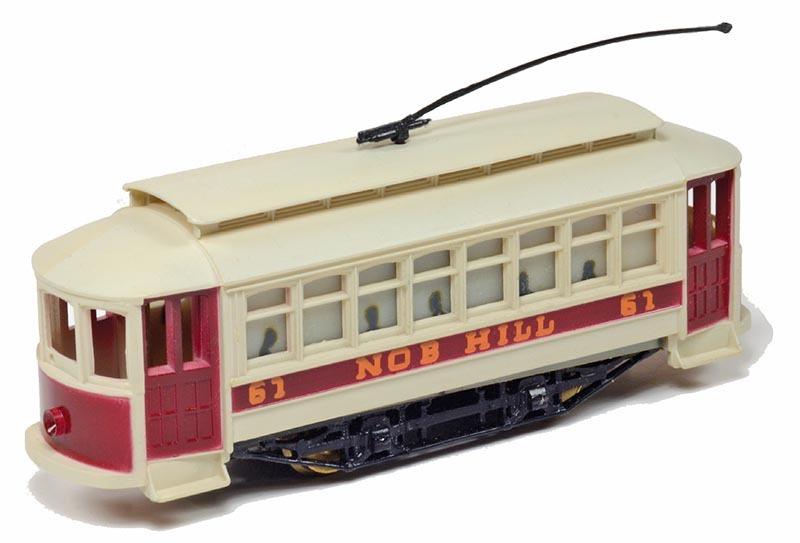 A Nob Hill lettered TYCO trolley model from the 1970s. Collectors will find a variety of packaging provided with this era’s production. This example came in a clear plastic clamshell case with “Brown Box” cardboard inserts to secure the trolley. 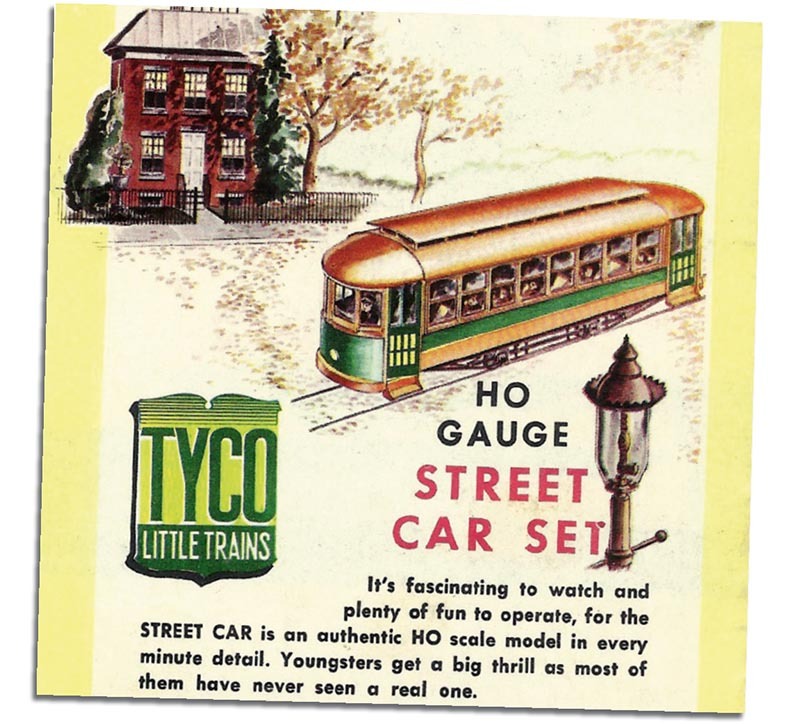 As early as 1955, the street car was advertised under the TYCO banner, as ready-to-run, showing a multicolor paint scheme on an unlettered model. Whether you prefer to call it a street car or trolley, what’s the scoop on this model? Let’s try to find a little history on this one before we get more specific on the models sold under both the Mantua and TYCO names. The history of Mantua and TYCO is somewhat complicated, and I covered it in my article “Mighty Mite: Plymouth CR-4 from Mantua/TYCO” in HO Collector’s 3rd Quarter 2017 issue, so I’ll go on from there. 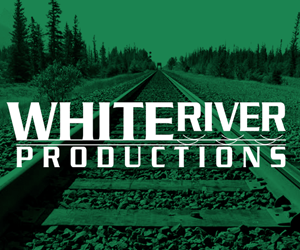 This model differs from the CR-4 critter diesel in that it starts out under the Mantua name in 1953, before showing up under the TYCO brand in 1955. This trolley model saw production as a Mantua kit from 1953 through the mid-1960s, and as a TYCO Ready-To-Run model from 1955 through the mid-1980s! The “TYCO Little Trains” moniker was used during the early 1950s and the earliest days of the TYCO line to brand and promote releases. Consider the prototype’s age: even this early 1950s catalog states most youngsters by this time had never seen a trolley of this type in service! In all my research I have not found any specific information from Mantua or anyone else describing exactly what the prototype is for the model. To the best of my observations, the model appears to be based on a turn-of-the- 20th Century Brill design, featuring that builder’s 21-E four-wheel traction truck. The 21-E was used on a number of production items from Brill as shown in the builder’s 1905 catalog. Brill customized each car order to the exact configuration each customer wanted. The Mantua/TYCO model is an eight-window version, but is basically the same design as the six-window Brill car prototype illustration. I have seen illustrations of this design showing anywhere from five to eight windows. There were window variations over the years, which included “convertible” and “semi-convertible” designs. In a semi-convertible car, as the model appears to be, this meant that the windows could be raised a short distance for ventilation (remember this is long before air-conditioning was common). The larger windows on the illustration show a convertible car, with windows which could be pushed up onto a slightly curved track under the roof. Based on my research, it appears the Mantua/TYCO street car or trolley is a generic version of this prototype. Now let’s get down to the story about the models, taking the information in roughly chronological order by each of the brand names starting with Mantua. This is the box lid for a 1953 Mantua trolley release. 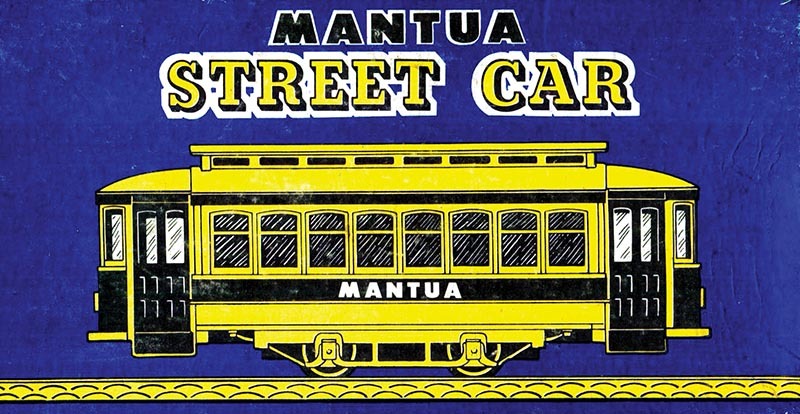 Promotional materials and packaging showed a street car carrying the company’s name; no “MANTUA” street car is thought to exist. This item retailed for $8.95 at the time. As stated earlier, it appears Mantua introduced this model in 1953. There is some discussion in the hobby community that the tooling for the body shell originates from a Japanese model and is not an original Mantua effort. While this may be the case, I can find no documentation to confirm, or deny, that this is accurate. The first release by Mantua had the part number “214” without a prefix or suffix. The model was sold as a kit, but had very simple construction. Its body was molded in a medium orangecolored plastic. It featured a #33552 open-frame five-pole Pittman-type 12-volt motor and had axle spacing of a scale seven feet, six inches. The 1955 Mantua catalog states that it will negotiate a 2 1/4-radius curve! Truck sideframes were scaled to this wheel spacing, and the axles were pointed. The model had electrical pickup from only one wheel on each side of the truck, which was a problem if you had dirty track or pickup wheels, and only had one geared axle for propulsion. The price in the January 1953 ad was listed as a “Fair Trade Price” of $8.95 (an astounding $82.00 in 2017 dollars). The original version does not have a trolley pole, suggesting that it represents a battery-powered prototype. This trolley had printed cardstock window inserts showing “passengers” in vintage attire riding the trolley. In a December 1955 ad, Mantua introduces the modeler to “street track.” This consists of three types: a 5-inch straight track section (#15692); a 5-inch straight terminal section (#15693); and an 8-inch radius 90-degree curved track segment (#15694). All are molded in light gray plastic with a “curb” on each side of the “street.” This track system, along with the trolley, would form the basis of several sets sold under both brand names (Mantua and TYCO). One such set is 1959’s Mantua “The Old Strap Hanger” (#5901), featuring a tandem pair (powered and dummy) of trolleys with “Coney Island” on the car sides. There were six pieces of track (three straight, one straight terminal, and four curved) included. There doesn’t seem to be any power pack provided in the set. For many train sets sold by Mantua and TYCO in the 1950s and 1960s, power packs were often a separate variant to releases, meaning you could purchase sets with or without a power source. 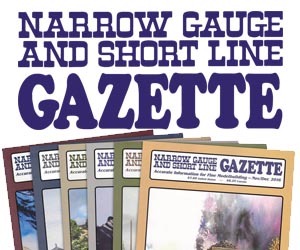 Read the rest of this article in the 2018-1 issue of HO Collector!